River Pools began installing fiberglass pools according to industry standards in 2001. In fact, they received formal training from the manufacturer of the fiberglass pools they were installing and carried out and followed their instructions perfectly. However, over time problems with the projects began to arise. They always returned to fix the issues, and every customer remained on their extensive reference list, but it came at a great cost of resources. After several years of costly repairs, River Pools finally took a step back and began to question everything. Determined that there had to be a better way to install fiberglass pools, River Pools looked at the root cause of the problems and worked to develop a solution for each one. After putting these solutions into practice, the problems vanished virtually overnight. With the tremendous success these solutions brought about, River Pools decided in 2011 that the methodology they developed deserved its own name, and that was the genesis of Rhino-Roc Construction. Since that time, they have dedicated themselves to teaching consumers and pool builders alike what they've discovered. This is precisely the reason why we are proud to be partnered with River Pools. What Types of Pool Problems Does Rhino-Roc Solve? For example, this image shows a pool that has settled, causing the concrete to crack and separate from the pool shell. We've found that the real challenge with inground pool related problems is that they are all connected. In other words, one issue will typically lead to another. For example, settlement around the pool can lead to a leak, then the infiltration of water can lead to additional shifting and movement. This results in an unfortunate chain reaction that, if never remedied, never ends. The fundamental philosophy of Rhino-Roc is to understand and prevent the root cause of these problems. What Are the Components of Rhino-Roc Construction? One area of concern is where the pool shell and patio join. We developed our Rhino-Rod to fuse the fiberglass pool shell and patio together to prevent shifting, settlement, or movement of any kind that could result in structural failure. The Rhino-Rod is a 12-inch-long composite rod that we install into the top of the pool shell. It becomes encased in the concrete bond beam that we pour around the perimeter of the pool. One of the major causes of pool plumbing leaks is movement.When pipes shift, this sets in motion a chain reaction that puts undue stress on the pipe, plumbing connections, and the attached components of the pool such as return jets, skimmers, and drains. 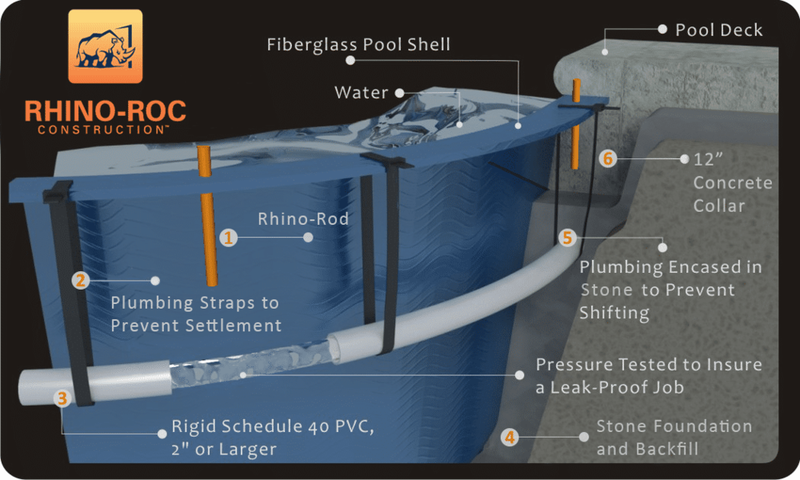 In Rhino-Roc Construction, we secure the plumbing by fastening the pipes to the pool shell using a strap system. This ensures no stress is placed on any component of the plumbing system. When installing a pool, there are basically two types of plumbing pipe to choose from: hard pipe or flexible pipe. In Rhino-Roc Construction, we only use hard pipe, because it does not flex and bend with the contours of the pool. It does require more effort to install, but because flexible pipe is actually not rated for underground use, we don’t feel it's worth the risk. What is backfill material? It is simply the material that we place under the pool and around the outside of the pool shell after it is set in the excavated hole. The use of clean, crushed stone backfill is imperative to the long-term success of a fiberglass pool installation. These are challenges we faced and fixed early on, but they virtually went away overnight the moment we stopped using sand and began using clean, crushed stone as our backfill material. The plumbing is encased in stone as well, which prevents plumbing settlement. Unlike sand, the right stone backfill will not move or settle. This creates a condition for long-term plumbing success. It drains better, it doesn't move, and doesn’t change its properties when wet. All inground fiberglass pools require some concrete to be poured around their perimeter to stabilize the pool shell. With Rhino-Roc Construction, this concrete bond beam is poured extra thick and flows under the lip of the fiberglass pool shell and encases the Rhino-Rod. As this concrete “bites” around the Rhino-Rod and the lip of the pool, it “locks” everything into place, ensuring the pool and patio will be structurally secure for many, many years. Eventually, all fiberglass pools will need to be drained. You must be able to inspect and remove any ground water around the outside of the pool shell to prevent damage. ecause we think long-term, our Rhino-Roc Construction includes a sump pipe so you can do just that.